INSANE LABZ Dark Metal Inc. 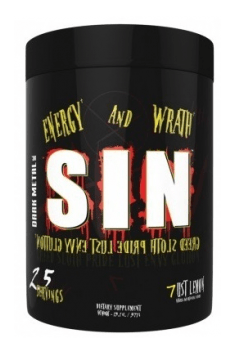 Sin is an advanced pre-workout supplement containing a whole range of the most effective substances that support training effectiveness: creatine monohydrate, beta alanine, betaine anhydrate, agmatine sulphate, citicoline, anhydrous form of caffeine, AMPiberry®, DMAE, hupercin A, and a special blend of ingredients that raise testosterone levels, including the Curculigo orchioides root extract and DHEA. Creatine monohydrate is the basic ingredient of every top pre-workout supplement. It is also effective as an independent mono preparation used to increase the body's exercise capacity. During the intense physical exercise, the energy required for ATP resynthesis comes from the phosphocreatine and anaerobic glycolysis simultaneous breakdown. It has been proved that creatine supplementation increases the body's ability to regenerate ATP, and increases strength and muscle mass. The tingling sensation associated with taking pre-workout supplements that contain beta-alanine is very common. It is paresthesia, a phenomenon associated with irritation of the nerve endings, which occurs as the result of a single overdose of this compound. During the cyclic beta-alanine supplementation, the following changes are observed: a decrease in the physical fatigue, an increase in the total volume of work performed at a maximum effort, an increase in the anaerobic capacity, and a general improvement of the training quality. All these advantages result in the development of muscle strength and mass. Betaine anhydrous plays an important role in maintaining the cells water balance. Due to its chemical structure it has many functions at both, the gastrointestinal and metabolic levels. As a methyl group donor, it participates in transmethylation reactions and donates its labile methyl group to the synthesis of several metabolically active substances, such as creatine and carnitine. It has a beneficial effect on the intestinal cells and microflora, and potentially increases the digestibility of certain nutrients, especially fibre and minerals. At the metabolic level, it participates in the proteins and energy metabolism. The capacity increase tests have demonstrated that the betaine supplementation increased the dressing percentage of farm animals by lowering their body fat content. Agmatine sulphate is a small molecule produced naturally in the body from the amino acid - arginine. Its supplementation positively influences the organism, because the natural agmatine concentration in the body is low. By increasing the production of nitric oxide (NO), agmatine affects the endothelial function, enhancing the muscle pump phenomenon and increasing the tissues oxygenation and nutrition. Recent research proved that by initiating protein synthesis it contributes to the muscle growth, and by stimulating adrenergic receptors it intensifies lipolysis. Cognizin® (Citicoline) raises the attention and awareness increasing focus and concentration during training. It secures the energy reserves of neurons, reduces apoptosis and increases the acetylcholine synthesis. By stimulating the biosynthesis of phospholipids in the neurons, it stabilizes their cell membranes, improving their functioning. It results in enhancing both, the neurotransmission process, and the sodium-potassium pump operation. In addition, it reduces the free radicals formation preventing cell membranes damage. AMPiberry® (Juniperus communis) prolongs the stimulating effect of other ingredients contained in this supplement, prevents energy falls and surges, ensuring stable stimulation at a constant, high level. This new component of pre-workout supplements replaced the illegitimate geranium, which was known for improving aerobic capacity, eliminating fatigue, improving concentration and allowing a huge increase in the exercises intensity. Dimethylethanolamine (DMEA) is a precursor in the acetylcholine synthesis, used as the central nervous system stimulant. This substance improves neuronal transmission, increases the ability to concentrate, increases psychophysical potential, reduces the need for sleep, improves mood, and has a calming effect. Hupercine A (1%) stops the acetylcholine breakdown increasing its amount circulating in the body, in particular within the nervous system. Acetylcholine is an important neurotransmitter responsible for transmitting information between the nerve cells. It improves focusing and remembering, and by transmitting signals between the muscle and nerve cells it accounts for the strength and efficiency of the muscle work. BlamusTM is an extract of the Curculigo orchioides root, standardized to 30% curculigosides. Recent scientific researches proved that its supplementation increases the amount of testosterone in a safe, innovative and natural way. It has a broad spectrum of applications in sports nutrition, muscle building and exercise pathophysiology. DHEA (dehydroepiandrosterone) is a natural steroid hormone produced in the human body. Due to its similarity to testosterone, it is very often present in the supplements used by physically active people and athletes. According to the popular opinion, DHEA increases the endogenous testosterone level, increasing the strength and muscle mass, and improving sports performance. INSANE LABZ Dark Metal Inc. Sin is a unique supplement intended for use before the planned training, to improve the body's exercise capacity. It contains substances that increase the body's ability to testosterone synthesis, and is recommended especially for people suffering from this hormone deficiency. Take 1 scoop 30 minutes before training. Depending on the specific sensitivity to the individual components of this product, and the weight of the person who is supplementing, it is recommended to adjust the individual doses. It can be done by using the nerve endings tinging as a determinant. The tingling is caused by too high dose of beta-alanine and if it is too strong, it means that too much of the supplement has been taken. When the tingling does not appear at all, it means that the dose may be too low, or this product has been used for too long. Then it is recommended to increase the dose or take a break in supplementation. Citric Acid, Silica, Malic Acid, Natural & Artificial Flavoring, Calcium Silicate, Tartaric Acid, Sucralose, Acesulfame Potassium (Ace K), FD&C Yellow #5.